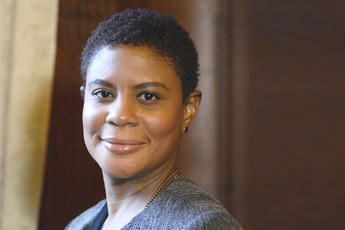 In July 2014, Dr. Alondra Nelson became the dean of social science at Columbia University, an inaugural position in the Faculty of Arts and Sciences. Growing up in a middle-class family in San Diego, education was centrally important to her. The first child of four, Nelson acknowledges how finances could have been stretched thin; however, her parents were able to send their children to private schools as well as expose them to the arts. “(Education) was really important to (my parents) and so it became important to me,” she says. At the University of California, San Diego (UCSD), Nelson studied anthropology as an undergraduate, including archaeology, which allowed her to combine her love for ancient communities as well as contemporary culture. She also cultivated a background in the African diaspora by minoring in both African history and Caribbean literature. On the recommendation of her mentor and American studies scholar, Dr. George Lipsitz, Nelson enrolled at New York University (NYU), with an interest in becoming an Americanist, working particularly on African-American culture and history. In her research, Nelson has studied themes that explore how African-Americans respond to scientific and technological developments. Her work has been supported by entities such as the Ford Foundation, the Woodrow Wilson National Fellowship Foundation and the Andrew W. Mellon Foundation. She has conducted research at institutions such as Harvard University, New York University, the London School of Economics, the Bavarian American Academy in Munich, the Max Planck Institute for the History of Science in Berlin and the Bayreuth Academy of Advanced African Studies at the University of Bayreuth in Germany. In her book, Body and Soul: The Black Panther Party and the Fight against Medical Discrimination, she discusses the organization’s efforts for social justice in the realm of health care, a lesser-known struggle by the group. The publication received several accolades, including the Mirra Komarovsky Book Award from the Eastern Sociological Society and the Distinguished Contribution to Scholarship Book Award from the Race, Gender and Class section of the American Sociological Association. Entering the realm of higher education as faculty, Nelson’s first tenure-track appointment was at Yale University, where she spent six years teaching African-American studies, American studies and sociology. As a professor, her constant objective has been to help students discover and understand the complexities of the world around them. To do this, she creates a “safe space” in the classroom, encouraging students to engage in open and honest dialogue. “I think it’s really important that all the students in a seminar space know each others’ name(s) and use each others’ names in conversations instead of just saying he said or she said—really engaging each other and taking each other seriously,” says Nelson. In 2009, Nelson was recruited as faculty at Columbia and a professor of sociology and gender studies. In 2013, she became director of the school’s Institute for Research on Women, Gender, and Sexuality, where she made a priority of reaching out to students by hosting town hall meetings on a range of topics including LGBTQ issues and seminars highlighting feminist concerns. To continue to make transformative experiences for students, Nelson says she realizes that she must create gateways for faculty. Within her first six months as dean, Nelson has focused on long-term strategic planning. By the end of her three-year appointment as dean, Nelson also hopes to have made the tenure track more “humane” and attainable for junior faculty.